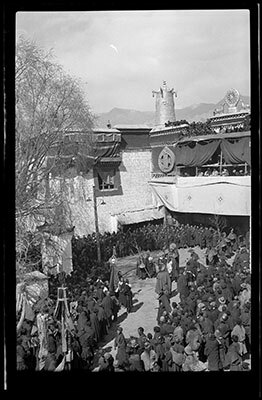 A group of monks carrying out a lu (glud) and a torma in the courtyard outside the main entrance of the Jokhang filled with crowds of spectators. The occasion is the ceremony of the Lugong gyalpo (glud 'gong rgyal po) which took place on the 29th day of the second Tibetan month. Manual Catalogues - Richardson's handlist Album 'A' - "Nos 1-20 illustrate the Scapegoat ceremony,the Glud-'gong rgyal-po , on the 29th day of the second month. no.2 The Kashag are seated in a balcony overlooking the courtyard in front of the Jokhang; and the Zhal-ngo -the Proctors of Drepung- are seated on the north side of the courtyard. The ceremony starts with a dance by Black Hat "magician" dancers. No. 6 Long trumpets, in the foreground, sound a summons and the scapegoats, two men dressed in half their face painted black and half white, run in to a great noise of clapping and whistling; they dance round the courtyard. The two have been chosen some time before and are allowed a great deal of liberty for some days before the ceremony when they demand food and money from the shopkeepers and passers-by who give for the sake of having their ill luck removed. While they dance money is thrown to them and bags of grain are offered to urge them to go away. One of the black-hatted dancers challenges the scapegoat to debate the merits of the doctrine and eventually it is decided to settle the dispute by casting dice with the Byang chub glong Abbot. This is done; and as the scapegoat's dice are all ones and the abbots are sixes, the result is a foregone conclusion. Nos 7-9 show that part of the ceremony. When the scapegoats lose, they are driven out: one goes to the north; the other, the more important, and probably of a long-standing tradition,goes to Samye. Formerly he spent the night in a terrifying cell there and is said usually to have died. 10,11,12 show the scapegoat leaving; the crowd throw money to him wrapped in white cloth. It is a chance to get rid of all bad money. (no 13 is missing)"
The Tibet Album. "Lugong ceremony outside the main entrance to the Jokhang" 05 Dec. 2006. The Pitt Rivers Museum. <http://tibet.prm.ox.ac.uk/photo_2001.59.9.10.1.html>.